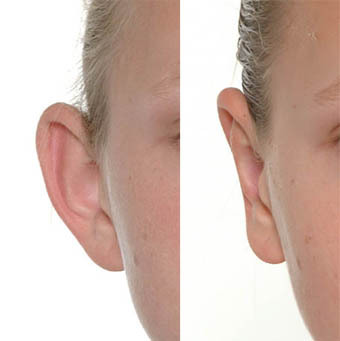 Prominent ears are sometimes called Bat Ears, Stick Out Ears, Dumbo Ears, and their correction, known as Otoplasty or Ear Pinning Surgery, is the most common procedure performed on the external ear. The problem is often inherited from one or both sides of the family and affected parents attest to the trouble that name calling and teasing caused them as a child. For this reason many parents will bring children for a consultation in the preschool years. For some types of Prominent Ear it may be possible to avert the problem by splinting or taping the ears in the first few months of life. This is not true of all types of Prominent Ear. Surgery is best left until the ear cartilage is stiff enough to allow a predictable result from surgery, which usually means after age 4. If possible it is nice to correct the problem before the child goes to school and therefore prevent teasing. For older children the surgery is equally effective and if there is teasing it usually stops as soon as the ears are corrected. 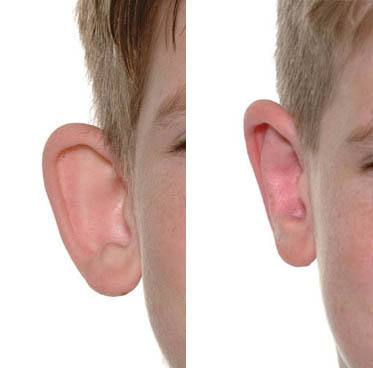 Adults with Prominent Ears often have suffered teasing as a child. Correction in the adult years can be a tremendous confidence booster. There are many variations on the theme of Prominent Ears. In the typical situation the antihelical fold – the fold in front of the rim – is pooly formed and unfolded (see photos above). In other cases the bowl is overly deep. 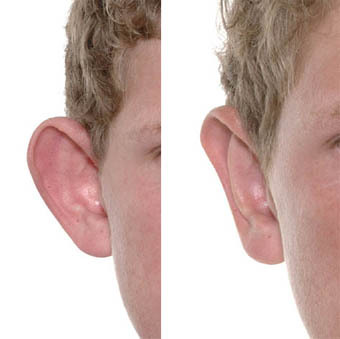 There may be prominence of the lobe or prominence of the upper pole complicating the issue. Unless all these issues are recognised and addressed appropriately an unsatisfactory result can occur. A number of Prominent Ears have mild constriction or cupping of the rim. It may be possible to expand the rim slightly at the time of surgery. This type of ear is more challenging. Surgery can be performed as a day procedure under general anaesthesia for children and local anaesthesia for adults. 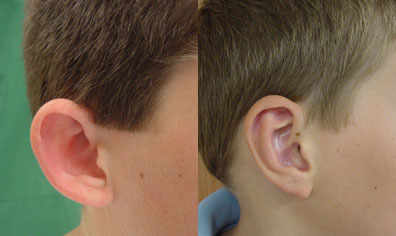 An incision is placed behind the ear where it is not visible and the cartilage of the ear manipulated to reshape the antihelix and reduce the bowl height. At the end of the procedure a padded head bandage is applied. The head bandage is only necessary for a few days as I typically stitch a small ‘bolster’ dressing against the antihelix to maintain position after the dressings are removed. The bolster is removed a week later. 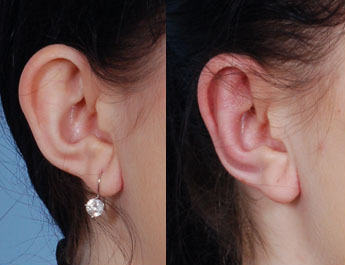 Initially the ear is bruised and tender but resolves over a few weeks. After 6 weeks normal sports can be resumed, swimming can be resumed as soon as the wounds are soundly healed. 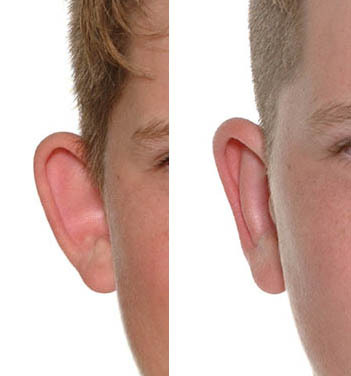 The aim of surgery is to have a natural ear sitting approximately 18mm from the scalp with a naturally curving fold and a natural balance between the upper and lower poles. Complications are rare but those with a history of keloid scarring need to be forewarned as it is possible to experience this problem in the scar behind the ear. 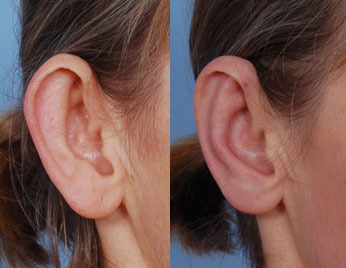 Below are some examples of prominent ears before and after surgery.